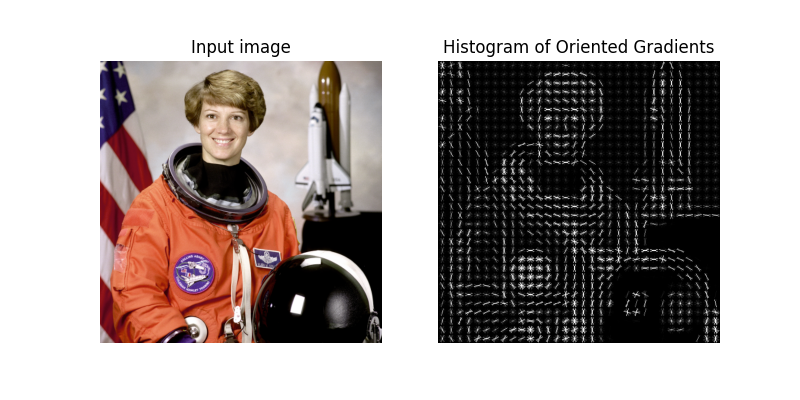 The Histogram of Oriented Gradient (HOG) feature descriptor is popular for object detection 1. The third stage aims to produce an encoding that is sensitive to local image content while remaining resistant to small changes in pose or appearance. The adopted method pools gradient orientation information locally in the same way as the SIFT 2 feature. The image window is divided into small spatial regions, called “cells”. For each cell we accumulate a local 1-D histogram of gradient or edge orientations over all the pixels in the cell. This combined cell-level 1-D histogram forms the basic “orientation histogram” representation. Each orientation histogram divides the gradient angle range into a fixed number of predetermined bins. The gradient magnitudes of the pixels in the cell are used to vote into the orientation histogram.